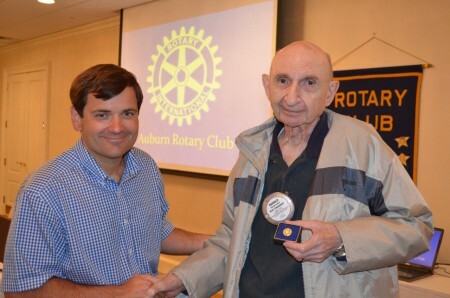 At the club’s May 9 meeting, long-time Rotarian Dr. Harold Zallen was presented his +5 multiple Paul Harris Fellow pin, recognizing his contributions in support of the Rotary Foundation. Rotary Foundation donors of $1,000 or more to the Annual Programs Fund, PolioPlus, or the Humanitarian Grants Program, or people who have that amount contributed in their name, can be recognized as Paul Harris Fellows. Each new Paul Harris Fellow receives a commemorative certificate and a pin. Donors of additional cumulative foundation gifts are recognized as multiple Paul Harris Fellows, which come with them the opportunity to honor someone else with a gift fellowship, and the presentation of recognition pins denoting their continued support.